Cry havoc, and let's sip the dregs of warm. 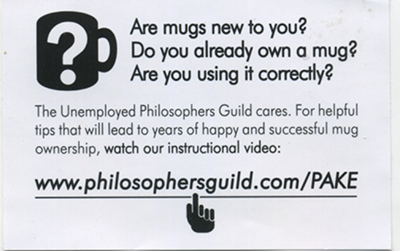 Forsooth, the best mugs for book lovers drinking hot beverages have been produced, courtesy of The Unemployed Philosopher's Guild, whose motto is "The Unexamined Gift is Not Worth Giving." (Somewhere Socrates is begging his executioner, "Make that a double"). "Some accounts trace the Guild’s birth to Athens in the latter half of the 4th century BCE. Allegedly, several lesser philosophers grew weary of the endless Socratic dialogue endemic in their trade and turned to crafting household implements and playthings. (Hence the assertions that Socrates quaffed his hemlock poison from a Guild-designed chalice, though vigorous debate surrounds the question of whether it was a 'disappearing' chalice). "More recently, revisionist historians have pinpointed the birth of the Guild to the time it was still cool to live in New York City’s Lower East Side. Two brothers turned their inner creativity and love of paying rent towards fulfilling the people’s needs for finger puppets, warm slippers, coffee cups, and cracking up at stuff. "There’s a bad joke: The engineer asks ‘how can I build that?’ the scientist asks ‘how does it work?’ and the philosopher asks ‘do you want fries with that?’ In all fairness to the Philosopher, he’s probably not referring to ontological French fries, but the 18th centrury thinker Jacob Fries. 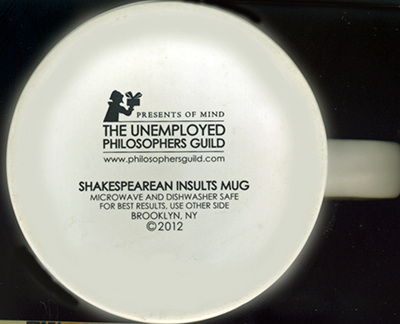 Anyway, some people think unemployed philosophers are funny. But why? Was it funny when philosophers gave us Democracy, Justice, Truth, Science, a sensible analysis of intramundane social practices or Freudian Slippers?" (from About Us). 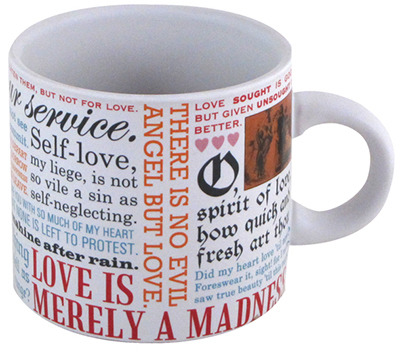 The Unemployed Philosopher's Guild has many mugs in its line but for book lovers seeking something to pour their heart into it features the Shakespearean Insult Mug, the Shakespearean Love Mug, the Banned Books Mug, and the First Lines Literature Mug. Each is $12.50. 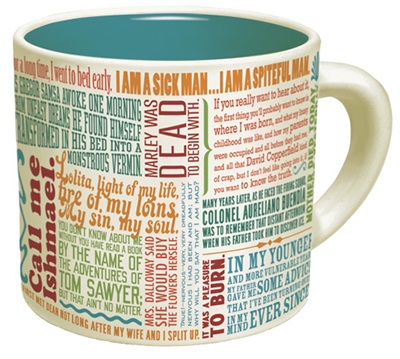 Henceforth, mugs simply emblazoned with "I ♥ Books" will make your coffee taste like last week's grounds and hot chocolate not so hot. 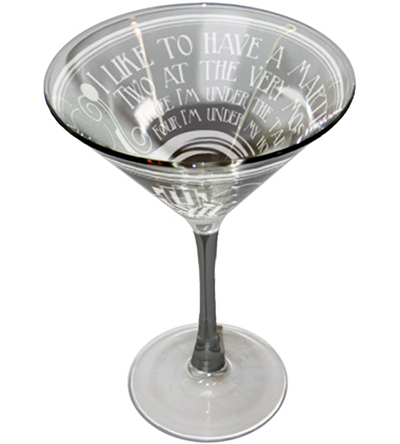 The Dorothy Parker Martini Glass. Four, I'm under my host." 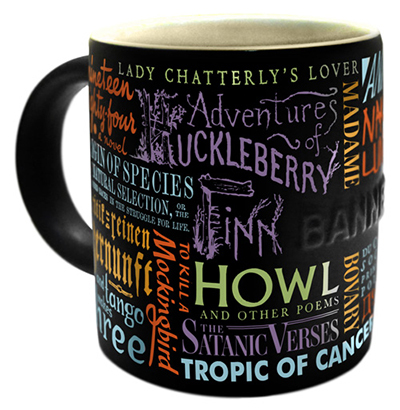 Book lovers who enjoy imbibing liquids whose psychotropic effects exceed those of caffeine will be pleased to learn that the UPG hasn't forgotten you. The Dorothy Parker Martini Glass will gently cradle dry vermouth and wet gin in whatever proportion you desire, whether shaken or stirred, for only $14.95. Olives and pearl onions not included. "For Best Results Use Other Side." 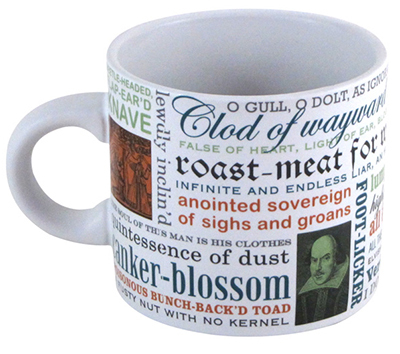 It has long troubled me that while manufacturers warn us not to pour liquids into television sets, spray underarm deodorant into eyes, use toilet brushes for oral hygiene, and that table salt is high in sodium, etc., mug-makers never provide directions for proper use or safety tips. 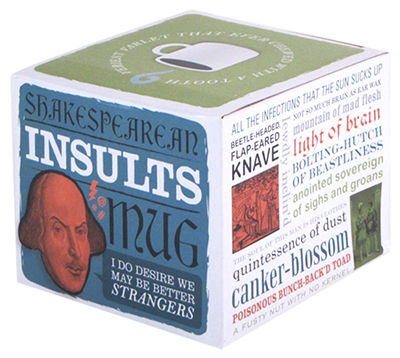 Moreover, the bottom of each box declares that UPG mugs are FDA approved and in compliance with California Prop. 65, the Safe Drinking Water and Toxic Enforcement Act. You can drink with confidence. I've yet to determine whether or not Eddie Lawrence, "The Old Philosopher," is a member of the UPG but, based upon the confluence of cracked minds, it seems he was a founding father.